The sounds of summertime wouldn’t be complete without the music from an ice cream truck! 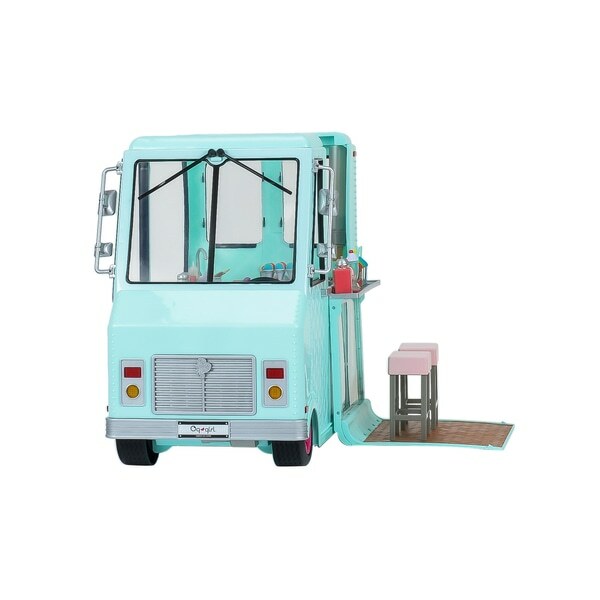 This cool Our Generation Sweet Stop Ice Cream Truck lights up, plays sweet melodies and features all kinds of cute accessories! 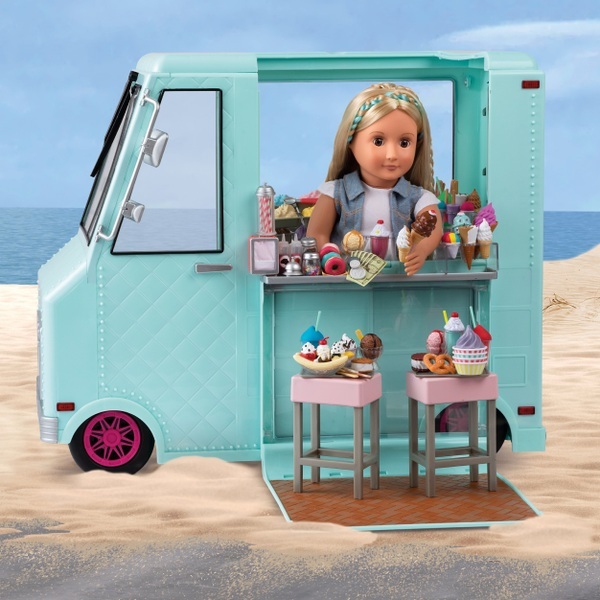 With colourful popsicles, realistic sundaes, doughnuts, pretzels, 2 stools and much more, your Our Generation doll and her friends are sure to have a blast in this delightful sweet-treat playset! Our Generation Sweet Stop Ice Cream Truck comes complete with 2 stools, 4 pieces of chalk, a customer bell, napkin holder, 6 paper bills, 3 coins, 2 ice cream cone holders, a popsicle holder, 3 containers, 3 drinking cups, 3 ice cream cups with syrup bottles, a coloured sprinkle shaker, a chocolate sprinkle shaker, 6 ice cones, 2 ice cream cones topped with nuts, 3 slushies, 3 doughnut trays, 2 swirl popsicles, 2 ice cream sandwiches, 3 pretzels, 6 trays with ice cream, 6 round popsicles, 3 cruller doughnuts, ice cream in a waffle cone, a soft ice cream in a cup, 3 soft ice cram cones, 2 chocolate dipped popsicles, 2 dipped popsicles with nuts, 3 double popsicles, 2 clusters of ice, 2 milkshakes with whipped cream topping, 2 flavoured ice cream cones with 2 paper cups, a large sundae, 6 doughnuts, 3 sundaes in a cup, 15 popsicles, 4 serving trays, 2 fridge racks and a deep fryer basket. (Dolls not included). User Information In order for the wipers to work the plastic clasp wrapped around them must be cut. The on-off and Try Me switch underneath the truck must be switched to on.